There, Mia was abandoned at a restaurant gate. The police were notified early that morning, August 21, 2006, and picked her up. They noted that she was only a few hours old. Whoever left her there, out of fear, or shame, or desperation, or panic, wanted Mia to live and gave her a chance at life. It is illegal to abandon babies in China, a punishable offense that is rarely enforced. Sometimes the abandoned babies show up in the most unlikely places, such as vegetable bins in outdoor markets. This is Mia's "Finding Spot". After more than two years of adoption paperwork and waiting, Brad & Glenda McMath received "the call" that Mia would be theirs. They had already decided to name her "Mia", which means "my girl". God has chosen 2 girls, Macy- age 5, and Mia who is almost 2 now... to be daughters in this family. One by birth. One by adoption. Both completly chosen by God to be "McMaths". One year ago today we flew from Beijing to Guangzhou on a 3 hour flight. 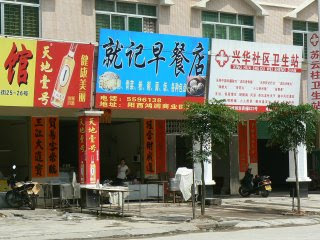 Mia's orphanage was in the Guangdong province in South China. Only one more day until we could hold our baby!